Name Variation Anton Alt was also known as Antona. Anton Alt was born on 5 April 1890 at Wisconsin. He was the son of Michael Alt and Catherine Pletzer. Anton Alt married Regina C. Ringelstetter, daughter of Andrew Ringelstetter and Catherine Pfeiffer, before 1913. Anton Alt died in 1958. 20 June 1895 Franklin, Sauk, Wisconsin Anton Alt is counted on the census of 20 June 1895 in the household of Michael Alt at Franklin, Sauk, Wisconsin; 4 male and 2 female; 6 born in US, 0 born in Germany; living next door to W. (Wolfgang Alt) and 3 houses from And. (Andreas) Alt. [S245] U.S. Federal Census 1900 U.S. Federal Census, by Ancestry.com, ED134. Dwelling 167. [S244] U.S. Federal Census 1910 U.S. Federal Census, by Ancestry.com, Year: 1910; Census Place: Franklin, Sauk, Wisconsin; Roll: T624_1736; Page: 6B; Enumeration District: 0115; Image: 894; FHL Number: 1375749. Alois Alt was born on 20 August 1891 at Wisconsin. Alois Alt died in February 1971 at age 79. 20 June 1895 Franklin, Sauk, Wisconsin Alois Alt is counted on the census of 20 June 1895 in the household of Michael Alt at Franklin, Sauk, Wisconsin; 4 male and 2 female; 6 born in US, 0 born in Germany; living next door to W. (Wolfgang Alt) and 3 houses from And. (Andreas) Alt. Alois Alt obtained US Social Security Card at Wisconsin; last residence Madison, Dane, Wisconsin. Albert Alt was born in January 1893 at Wisconsin. Albert Alt died before December 1976. 20 June 1895 Franklin, Sauk, Wisconsin Albert Alt is counted on the census of 20 June 1895 in the household of Michael Alt at Franklin, Sauk, Wisconsin; 4 male and 2 female; 6 born in US, 0 born in Germany; living next door to W. (Wolfgang Alt) and 3 houses from And. (Andreas) Alt. Regina Alt was born in October 1894 at Wisconsin. She was the daughter of Michael Alt and Catherine Pletzer. Regina Alt died before December 1976. 20 June 1895 Franklin, Sauk, Wisconsin Regina Alt is counted on the census of 20 June 1895 in the household of Michael Alt at Franklin, Sauk, Wisconsin; 4 male and 2 female; 6 born in US, 0 born in Germany; living next door to W. (Wolfgang Alt) and 3 houses from And. (Andreas) Alt. 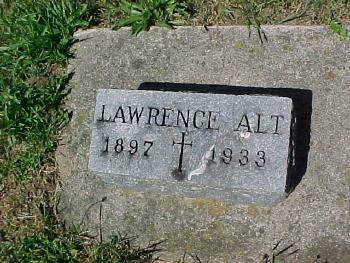 Lawrence Alt was born in January 1897 at Wisconsin also reported as Jan 1896. 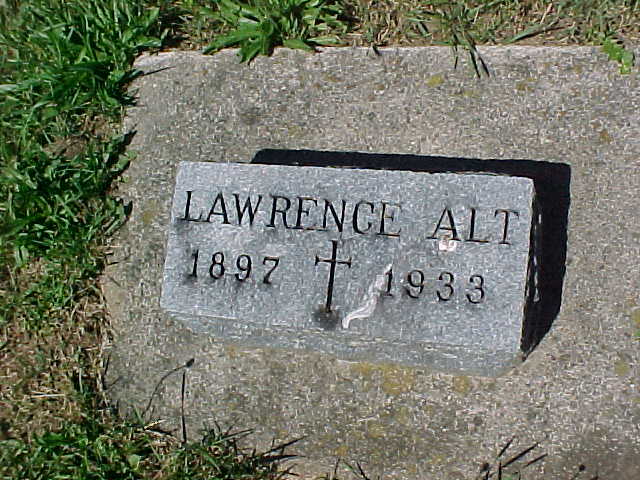 Lawrence Alt was buried in 1933 at Old St Lukes Cemetery, Franklin, Sauk, Wisconsin. Herman J. Alt was born on 23 March 1900 at Plain, Sauk, Wisconsin. Herman J. Alt died on 7 December 1976 at age 76. Herman J. Alt obtained US Social Security Card at Wisconsin; last residence Verona, Dane, Wisconsin. Married Name Her married name was Ruhland. Alma Mary Brechtl married Anthony G. Alt, son of Leo Alt and Tillie Haas, at last marriage for her. Alma Mary Brechtl married Alvin Arthur Ruhland, son of Joseph G. Ruhland and Sophia Malterer. Alma Mary Brechtl was born on 1 February 1914 at Wisconsin. She was the daughter of Frank Brechtl and Frances Bayer. Alma Mary Brechtl died in December 1995 at age 81. Alma Mary Brechtl obtained US Social Security Card at Wisconsin; last residence Plain, Sauk, Wisconsin. Ludwig J. Alt was born in 1896 at Wisconsin. He was the son of John B. Alt and Katherine Ringelstetter. Ludwig J. Alt died in 1973. Clarence Alt was born in 1909 at Wisconsin. 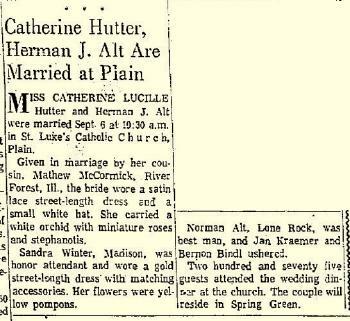 Clarence Alt married Caroline L. Ferstl, daughter of Henry H. Ferstl and Lillian Needham, in 1935. Clarence Alt died in 1937. Name Variation Emelia C. Alt was also known as Emma C.
Married Name before 1920 As of before 1920,her married name was Pretsch. Emelia C. Alt was born circa 1897 at Wisconsin. She was the daughter of John B. Alt and Katherine Ringelstetter. Emelia C. Alt married (?) Pretsch before 1920. Herman John Alt was born on 7 September 1901 at Wisconsin. 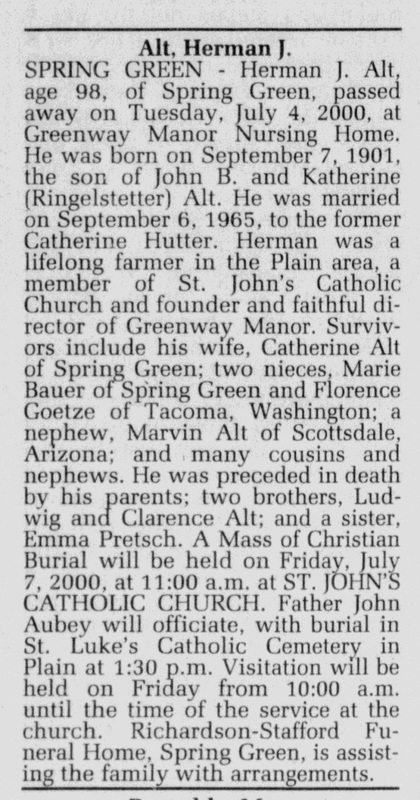 Herman John Alt married Catherine Lucille Hutter, daughter of Christ Joseph Hutter and Alwena Minnie Weitzel, on 6 September 1965 at Plain, Sauk, Wisconsin, Catherine Lucille Hutter and Herman John Alt marriage announcement. 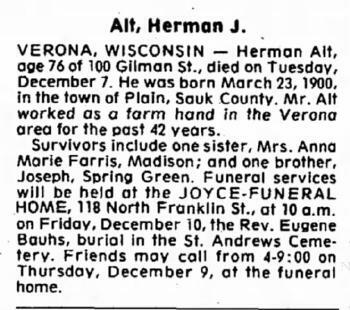 Herman John Alt died on 4 July 2000 at Spring Green, Sauk, Wisconsin, at age 98 Herman John Alt obituary. Joseph M. Alt was born in 1917 at Wisconsin. He was the son of Joseph Alt and Rose Gruber. [S243] U.S. Federal Census 1920 U.S. Federal Census, by Ancestry.com, Year: 1920; Census Place: Franklin, Sauk, Wisconsin; Roll: T625_2015; Page: 7B; Enumeration District: 164; Image: 83. Married Name 6 September 1965 As of 6 September 1965,her married name was Alt. Catherine Lucille Hutter was born on 9 January 1912 at Wisconsin. She was the daughter of Christ Joseph Hutter and Alwena Minnie Weitzel. 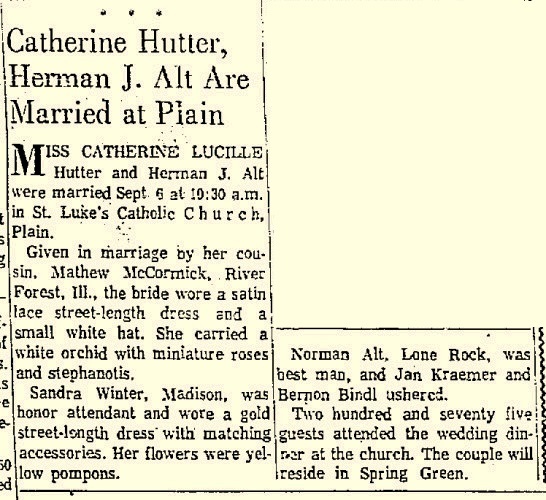 Catherine Lucille Hutter married Herman John Alt, son of John B. Alt and Katherine Ringelstetter, on 6 September 1965 at Plain, Sauk, Wisconsin, Catherine Lucille Hutter and Herman John Alt marriage announcement. Catherine Lucille Hutter died on 23 May 2001 at age 89. [S243] U.S. Federal Census 1920 U.S. Federal Census, by Ancestry.com, ED164. Dwelling 114. [S250] U.S. Federal Census 1930 U.S. Federal Census, by Ancestry.com, ED13. Dwelling 93. Name Variation Anna M. Alt was also known as Anne Alt. Name Variation Anna M. Alt was also known as Annie. Married Name circa 1911 As of circa 1911,her married name was Grauvogl. Anna M. Alt was born in July 1889 at Wisconsin. She was the daughter of Andreas Alt and Anna Kiener. Anna M. Alt married William Grauvogl, son of Joseph Grauvogl and Mary (? ), circa 1911. Anna M. Alt died after April 1940. 20 June 1895 Franklin, Sauk, Wisconsin Anna M. Alt is counted on the census of 20 June 1895 in the household of Andreas Alt at Franklin, Sauk, Wisconsin; 3 male and 2 female; 2 born in US, 3 born in Germany; living 3 houses from W. (Wolfgang) Alt. [S245] U.S. Federal Census 1900 U.S. Federal Census, by Ancestry.com, ED134. Dwelling 104. [S244] U.S. Federal Census 1910 U.S. Federal Census, by Ancestry.com, ED115. Dwelling 90. [S243] U.S. Federal Census 1920 U.S. Federal Census, by Ancestry.com, Year: 1920; Census Place: Spring Green, Sauk, Wisconsin; Roll: T625_2015; Page: 3A; Enumeration District: 178; Image: 452. [S250] U.S. Federal Census 1930 U.S. Federal Census, by Ancestry.com, Year: 1930; Census Place: Franklin, Sauk, Wisconsin; Roll: 2609; Page: 7B; Enumeration District: 13; Image: 122.0; FHL microfilm: 2342343. [S373] U.S. Federal Census 1940 U.S. Federal Census, by Ancestry.com, Year: 1940; Census Place: Bear Creek, Sauk, Wisconsin; Roll: T627_4523; Page: 5B; Enumeration District: 56-9. John A. Alt was born in February 1883 at Germany also reported as Wisconsin. He was the son of Andreas Alt and Anna Kiener. John A. Alt married Katherine T. Decker circa 1910. John A. Alt died in 1956. 20 June 1895 Franklin, Sauk, Wisconsin John A. Alt is counted on the census of 20 June 1895 in the household of Andreas Alt at Franklin, Sauk, Wisconsin; 3 male and 2 female; 2 born in US, 3 born in Germany; living 3 houses from W. (Wolfgang) Alt. John A. Alt immigrated with Anna Kiener and Andreas Alt in 1886. [S243] U.S. Federal Census 1920 U.S. Federal Census, by Ancestry.com, Year: 1920;Census Place: Franklin, Sauk, Wisconsin; Roll: T625_2015; Page: 5A; Enumeration District: 164; Image: 78. [S250] U.S. Federal Census 1930 U.S. Federal Census, by Ancestry.com, Year: 1930; Census Place: Franklin, Sauk, Wisconsin; Roll: 2609; Page: 1A; Enumeration District: 13; Image: 109.0. Name Variation Katherine T. Decker was also known as Kate. Name Variation Katherine T. Decker was also known as Catherine. Married Name circa 1910 As of circa 1910,her married name was Alt. Katherine T. Decker was born in 1889 at Germany. She married John A. Alt, son of Andreas Alt and Anna Kiener, circa 1910. Katherine T. Decker died in 1986. Name Variation Anna Frances Ringelstetter was also known as Annie F.
Married Name circa 1908 As of circa 1908,her married name was Alt. 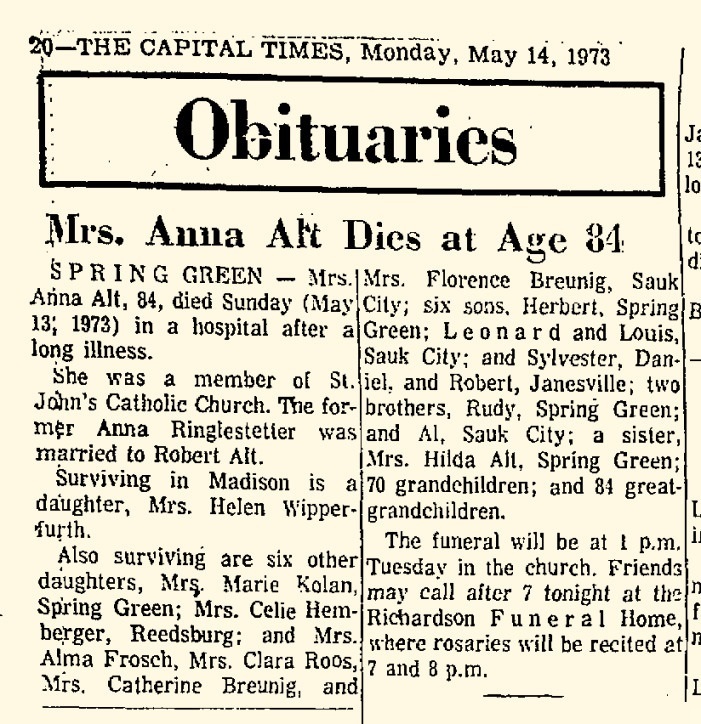 Anna Frances Ringelstetter was born in April 1889 at Wisconsin. She was the daughter of Andrew Ringelstetter and Catherine Pfeiffer. Anna Frances Ringelstetter married Robert Alt, son of Wolfgang Alt and Margaretha Bindl, circa 1908. 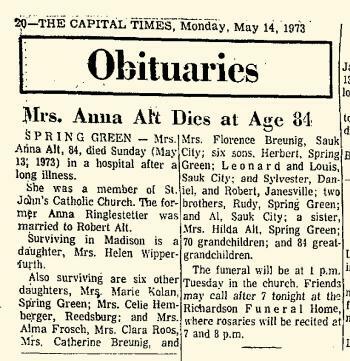 Anna Frances Ringelstetter died on 13 May 1973 at age 84 Anna (Ringelstetter) Alt obituary. [S245] U.S. Federal Census 1900 U.S. Federal Census, by Ancestry.com, ED145. Dwelling 113. Leo J. Alt was born in 1904 at Wisconsin. Leo J. Alt married Hilda M. Ringelstetter, daughter of Andrew Ringelstetter and Catherine Pfeiffer, in 1932. Leo J. Alt died in 1973. Raymond J. Alt married Hilda M. Ring, daughter of Michael Adam Ring and Christina C. Haas. Raymond J. Alt was born in 1906 at Wisconsin. Henry M. Alt was born in 1908 at Wisconsin. Henry M. Alt married Julia E. Mears, daughter of William Patrick Mears and Clara Anna Fargen, on 8 November 1938. 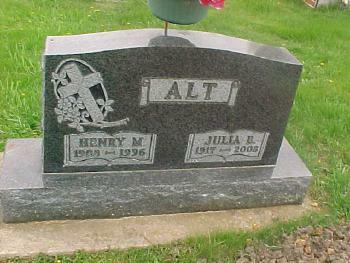 Henry M. Alt was buried in May 1996 at St Patrick Loretto Cemetery, Bear Cerek, Sauk, Wisconsin. He died in May 1996. Norman Alt married Alvina (?). Norman Alt was born in 1909 at Wisconsin. 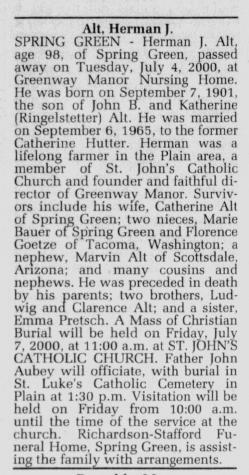 Norman Alt was the best man at the wedding of Catherine Lucille Hutter and Herman John Alt on 6 September 1965 at Plain, Sauk, Wisconsin; Catherine Lucille Hutter and Herman John Alt marriage announcement. Norman Alt died in 1995. Alvina (?) married Norman Alt, son of Joseph Alt and Rose Gruber. Alvina (?) was born in 1908. 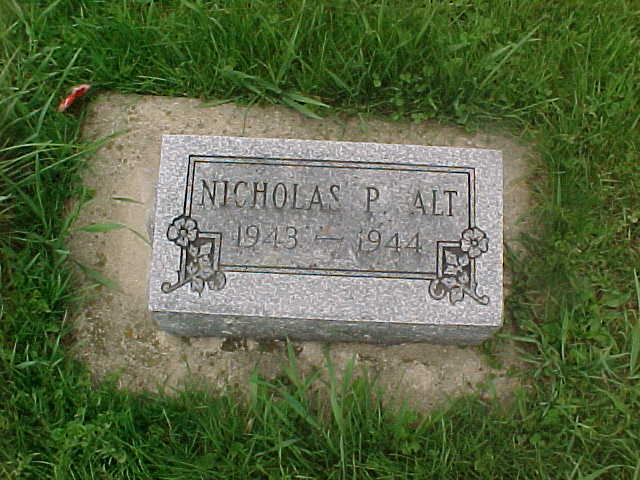 Nicholas P. Alt was born in 1943. He was the son of Norman Alt and Alvina (?). Nicholas P. Alt was buried in 1944 at St Patrick Loretto Cemetery, Bear Cerek, Sauk, Wisconsin. Name Variation Hilda M. Ring was also known as Hildagard. Name Variation Hilda M. Ring was also known as Hildegarde. Hilda M. Ring married Raymond J. Alt, son of Joseph Alt and Rose Gruber. Hilda M. Ring was born on 1 April 1909 at Wisconsin. She was the daughter of Michael Adam Ring and Christina C. Haas. Hilda M. Ring died in August 1986 at age 77. Infant Alt died in 1932. She was born in 1932. She was the daughter of Raymond J. Alt and Hilda M. Ring. Name Variation Michael Adam Ring was also known as Mike. Michael Adam Ring married Christina C. Haas. Michael Adam Ring was born on 25 July 1886 at Sauk, Wisconsin, also reported as 1885. He was the son of Georg Adam Ring and Franziska Roetzer. Michael Adam Ring died in 1966. Married Name Her married name was Ring. Christina C. Haas married Michael Adam Ring, son of Georg Adam Ring and Franziska Roetzer. Christina C. Haas was born in 1885. Albert G. Ring married Martha M. (?). Albert G. Ring was born in 1907 at Wisconsin. He was the son of Michael Adam Ring and Christina C. Haas. Albert G. Ring died in 1956. Walter P. Ring was born in 1914 at Wisconsin. Walter P. Ring married Angela K. Beck, daughter of Lawrence F. Beck and Louise M. Brechtl, before 1943. Walter P. Ring died in 1943. Martha M. (?) married Albert G. Ring, son of Michael Adam Ring and Christina C. Haas. Martha M. (?) was born in 1908.